Originally published in May 2015 and updated April 3, 2019. When you are in the south of France, Italy is just around the corner. A trip from France to Cinque Terre will present you with jaw-dropping sites so it is definitely worth the visit. 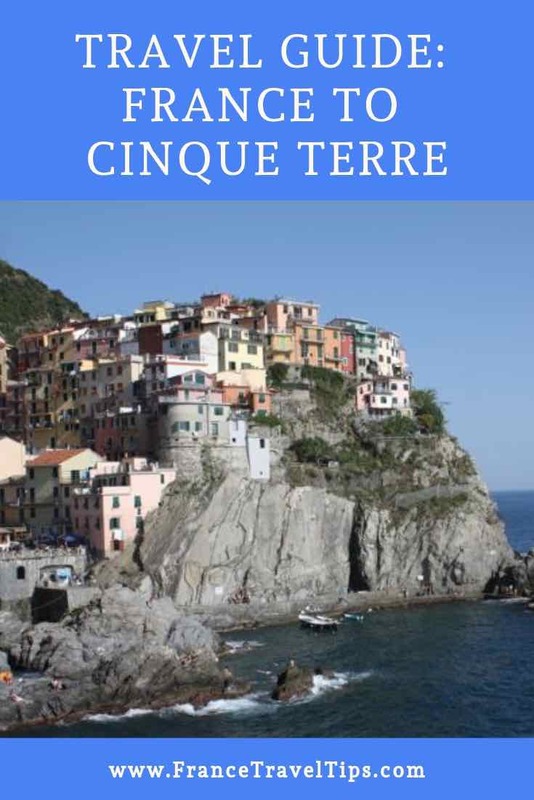 Cinque Terre is known for having the five (hence, “Cinque”) towns on the hillsides of the Italian Riviera and I ended my 5 1/2 week trip with a couple of nights in the region before I headed home. You’ve likely seen pictures of one of the five towns (Monterosso, Vernazza, Corniglia, Manarola, and Riomaggiore) and yes, the towns are STUNNING!! Your jaw drops when you look down on the towns during a hike or looking up from the ferry. I suggest you do both. 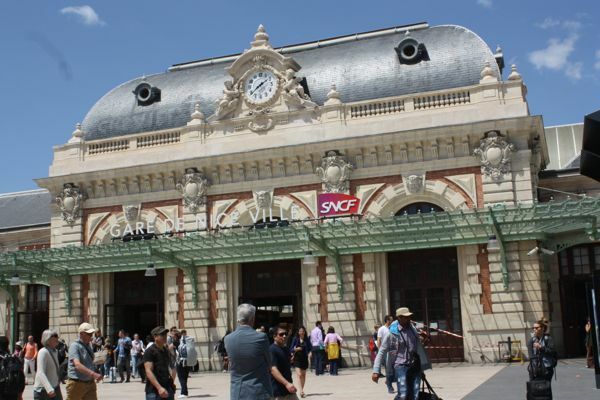 You can easily get to one of the towns by train from France. Sure, you could drive but you’d end up just leaving your car in a town and taking the ferry or train to the other towns. One does NOT drive from town to town. The parking in each of these towns is tight, steep, and you’d have a difficult time even finding a parking spot. In mid-May I drove to Nice and dropped off my rental car. The plan was to travel by train to Genoa where I would buy another ticket to Riomaggiore. Total travel time on the train was to be 5 hours. Of course things didn’t work out that way. They cancelled my train to Genoa but I was able to get another one. In Genoa I bought a 2nd class return ticket for 15 €. If you do this, remember to validate your ticket in the machine. My return ticket allowed me to return any time on the day I had chosen. I finally arrived in Riomaggiore at 9 pm, absolutely exhausted but was able to get the (last) shuttle from the town that went up the (very steep) hill to my hotel (cost: 2.5 €—it was worth every cent, especially as I had luggage with me). Weather: The weather in mid to late May was hot (high 20 degrees C) and sunny. The hotel I was staying at had an excellent buffet breakfast with cereals, meats, fruit, yogurt, and various coffees. The owners were very helpful and gave me a bus ticket so that I could take the bus from Riomaggiore to Volastra. From Volastra I began my hike. The folks at the hotel I was staying at recommended the route from Volastra to Corniglia; however, they should have asked if I hiked. I have hiked but I would not call myself a “hiker”. At times I was scared of slipping; however, the views were worth it. They were breathtaking. Those phrases, “worth it” and “breathtaking” were used by fellow hikers and me constantly. I walked around Corniglia and of course, had to get some gelato. My reward for hiking. Lunch was at the highly rated “Trattoria da Billy” that another guest at my hotel had recommended. The sea bream, grilled mixed vegetables and 1/2 a bottle of Cinqueterre wine were perfect. The owner then had me try 4 different liqueurs to sample. It wasn’t a cheap meal but it was excellent (cost: 50 €). After lunch, I walked up the hillside to get good views of Manarola. It was very steep and a bit hair-raising, but once again, worth the views. When you are in Manarola, order some take-out deep fried calamari from Mama Mia for 5 €. It’s a great deal and the calamari is fresh. Headed back by train to Riomaggiore. The trip only takes about 3 minutes. I bought the 1 day Cinque Terre Trail Pass for 12 € and took the train from Riomaggiore to Vernazza to begin my hike. 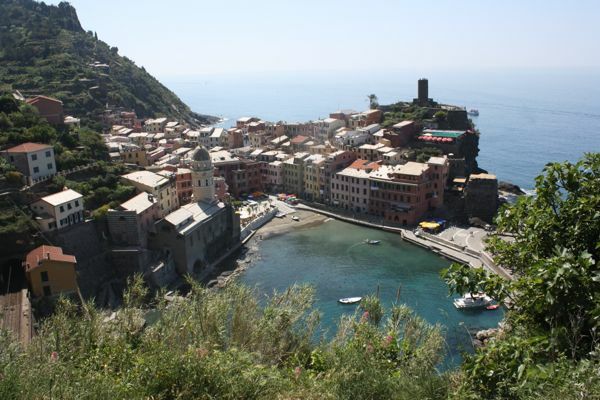 The Parco Nazionale Cinque Terre website has lots of information. 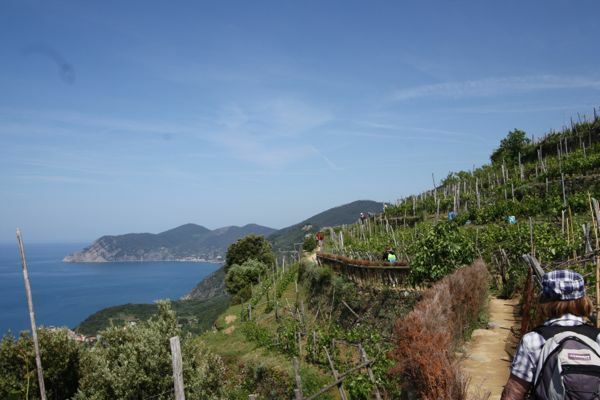 I was advised that the best way to go is in the direction FROM Vernazza TO Monterosso. There are still lots of ups and downs and not as many tourists go in this direction. Yes, at times the narrow trail becomes crowded and yes, technically you could fall off the cliff. Just saying. I stopped at a cafe for a café latte and when the owner asked if I wanted a pastry, I said no. He immediately said I must be Canadian because we don’t eat pastries! So, of course, I ordered one. Wasn’t he good at getting customers to buy something!? I started my hike late in the morning and met up with some Australians. They invited me to join up with them and together we hiked the 2-hour trail. It wasn’t as bad as the Day 1 hike and again, the views were stunning. When our hike was over, I was dripping. It was about 27 degrees C. and afterward, I realized I got a sunburn. We went to a restaurant but after waiting and waiting, we decided to leave. Really bad service. That’s when the owner (?) threw my napkin at me and hit one of the Australians. She was mad we had messed up her napkins and were leaving. The rest of the locals were nice. 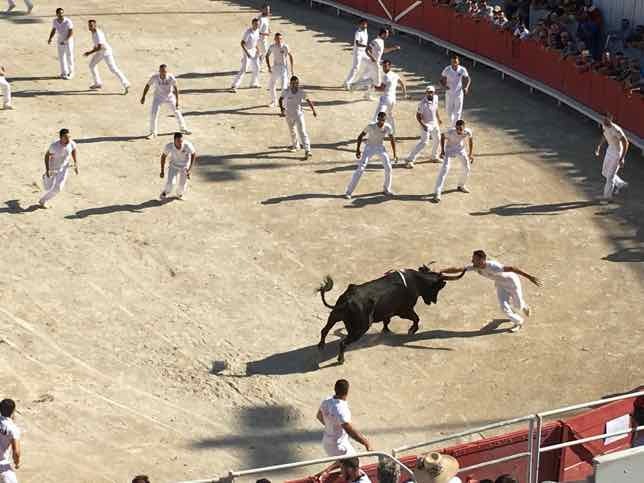 Maybe this owner was simply fed up with all the tourists. Yet, tourist dollars do help the Cinque Terre economy. It’s a double-edged sword. I walked around Monterosso and then took the ferry back to Riomaggiore. The views are always spectacular when you are leaving one of the towns or approaching a town—by foot or by boat. 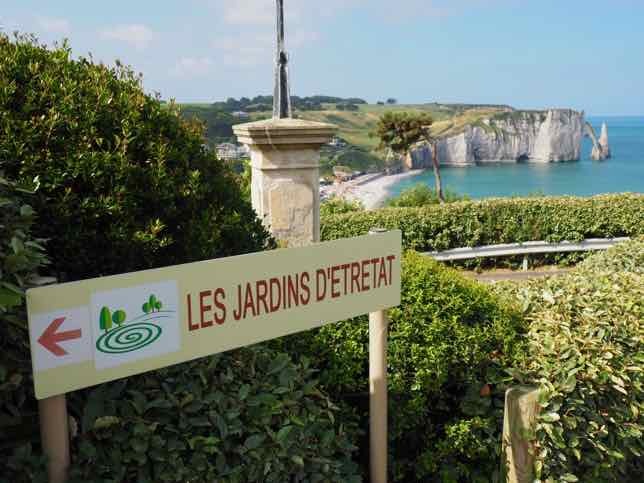 The hiking paths are at the top of the towns, so you are looking down at them and getting picture-perfect views. When you arrive by train, you are at the base of the town, by the water. Be sure to take the ferries. The one from Monterosso to Riomaggiore stops at each of the other towns. Be prepared to enjoy fresh fish and seafood every day. 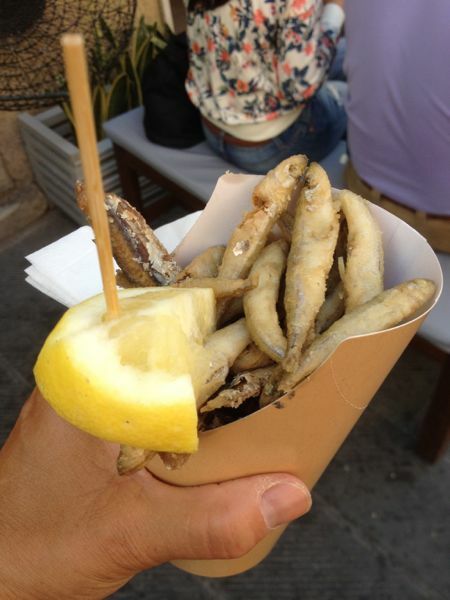 I took a liking to sardines and anchovies but certainly loved the sea bass and calamari. 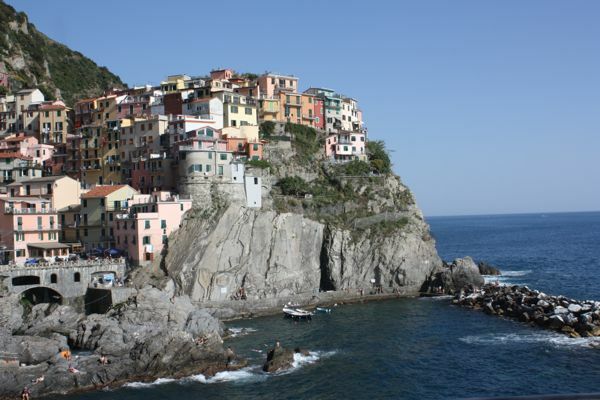 Like Venice, Cinque Terre is immensely popular. So popular in fact that there has been much talk about limiting the number of tourists who are allowed into the area. It felt like a hot summer even though it was May and to hike between the towns, I wore shorts, a sleeveless running top, and running shoes. Be sure to bring a hat, wear sunscreen and carry lots of water. 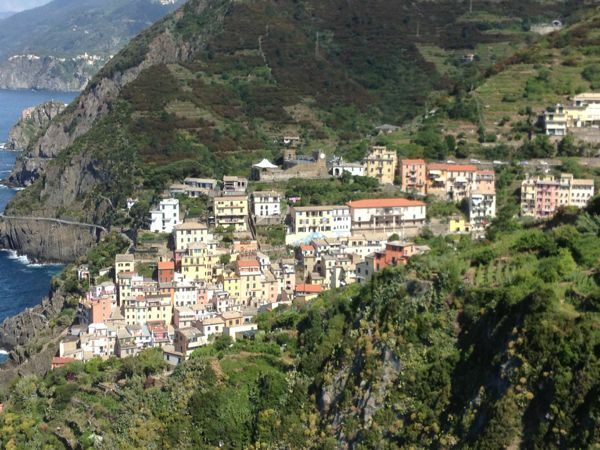 Do you need to be in shape to hike the Cinque Terre? Yes. You also need hiking, trail or running shoes. At the end of my hike to Monterosso, I was asked by an American at the end how long the hike was. I said 2 hours and that it was strenuous but the views were worth it. I added that she better have water. All she kept saying was, “You have to be kidding”. I wasn’t. Don’t think she was prepared for real hiking. Cinque Terre has always been on my bucket list and I am fortunate that I was able to add it on to my trip to France and Spain. 5 1/2 weeks, however, is a long time and I was very happy to head home. I almost didn’t make it home. In Italy, the hotels hang onto your passport. I forgot to pick it up the evening before I flew home and when I left at 5:45 am, no one was at the desk. When I realized at the airport shuttle stop, I ran back to the hotel, which, thankfully, was only a block away. But the door was locked and no one was there. So I frantically rang the doorbell and finally someone heard, got me my passport and I caught the shuttle bus to the airport and did not miss my flight! 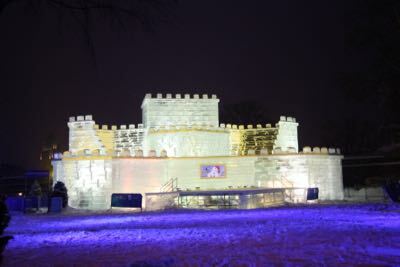 If you’re looking for more unique experiences in France be sure to check out my growing list of the Top 100 Experiences In France or Unique Experiences in Paris. Sadly, no. Too much good wine and food in France and Italy. Anything lost was quickly gained back….but enjoyed every moment. wow that IS a long time to be away….but it sounds fabulous – and it’s nice to appreciate returning. I am going to a Girlfriend to Monaco/Nice in June. We would like to take a train from Nice to Cinque Terre. I would really appreciate if you can please let me know what’s the train we need to take there and how long is train ride there. I am looking forward to your feedback. Thank you in advance for your help! Nice to Genoa was about 3 hours. If I recall I then had to buy a ticket to get to Riomaggiore. A return ticket was 15 Euros. I honestly don’t remember how long that train was but in my notes I left at 6:11 pm and arrive IN my hotel in Riomaggiore at 9:00pm. I took the shuttle that is at the base of the town up to my hotel (at the top of the town). Sorry, but I don’t have the train number, only what my destinations were. I hope this helps you out somewhat. Can i ask – What airport did you fly out of? I flew back to Canada from Genoa but had to go through Rome. Genoa was the closest airport to Cinqueterre and is actually quite a nice town to visit. I’ve sent you an email just in case you don’t see this. I’m going through my notes to try to figure out what happened during my trip. From Nice I was supposed to go to Genoa but they cancelled my train so I had to take a different one from Nice to Ventimiglia. When I arrived there I asked the conductor what to do. She said there was a train right there heading for Riomaggiore, so it all worked out. The train went from Ventimiglia to Genoa then from Genoa to Riomaggiore. 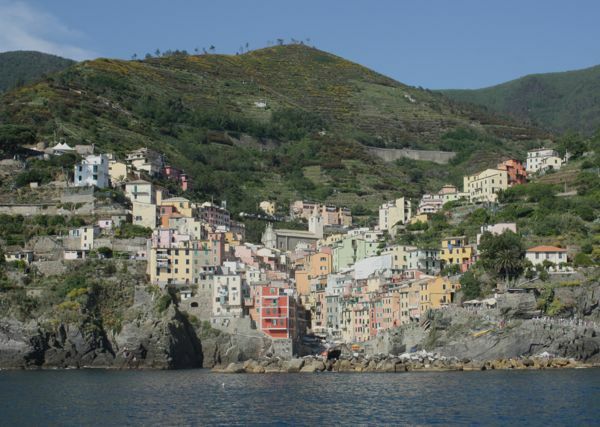 When I arrived in Riomaggiore, I took a town van from the train station (lower level) to the hotel (high up on a hill). I only stayed in Riomaggiore for 3 nights at a hotel called: Cinqueterre Residence Hotel . It had gotten great reviews and it was good. But basically I only had 2 full days. Each day I would take a bus, train or boat to a town and hike from that town to another town. 2nd day: bought the 1 day Cinqueterre Trailpass (12 E) and took the train from Riomaggiore to Vernassa and then my notes said I went to Monterossa but I’m not sure how I got there. Took ferry to go back to Porto Verde and walked around Monterossa. Took ferry back to Riomaggiore. We are three in gr is it worth taking mydaytrip car driver. Not really sure I understood the last sentence. Is it worth having a driver take you from Nice to Cinqueterre? It will certainly be easier, but more expensive to take you rather than taking the train. Personally, I would rent a car, drive to one of the towns and leave my car there. If I had two days I’d visit a few of the towns. It’s more fun to take the boat to get from town to town as you will have great views. If you can’t rent a car, then you might consider taking the train, but as you have to switch trains, there’s always a risk of a delay, etc.which isn’t great as you would only have 2 days.